The Washington Nationals won more games than 13 other teams in the National League. While on their way to their 4th 95+ win season in the last 6 years, the Washington Nationals gained the reputation of being an offensive powerhouse. The Nationals found themselves in the top 5 teams in almost every category during the regular season. If someone could find that offense and return them to Wrigley Field, that would be great. Seriously, in a postseason rife with Starting pitchers exiting way earlier than expected, one would think the Nationals pitching would follow suit. That’s not the case, not in the slightest. However, where their pitching has excelled, their well-documented offense has disappeared into the October air. It’s astounding how poorly the Nationals have fared at the plate in these last 3 games. Now, of course, credit where credit is due, the Washington Nationals Starters have been lights out in a major way. In Game 1, Stephen Strasburg pitched 7 innings of three-hit baseball, only giving up 2 runs off of singles by Kris Bryant and Anthony Rizzo. Both runs were unearned due to the fact that the first run came off an E5 throwing error by Anthony Rendon. These two spots are blemishes on Strasburg’s franchise record-setting 10 strikeout game. Not Strasburg’s fault. He was let down. We’re going to continue talking about the pitchers because I want to save the hitters for later. DEAL WITH IT. Game 2 featured Gio Gonzalez, the guy who stepped up big time for the Nats in 2017. The Nats jumped out early to a 1-0 lead thanks to a dinger off the bat of Anthony Rendon, who was no doubt trying to make up for the error he committed the night before. Immediately after, Wilson Conteras blasts a homer to right. Two innings later, Rizzo strikes again, dropping a dinger into the right-field stands. 3-1 Chicago. The game would stay that way until the bottom of the 8th inning when two home runs by Bryce Harper and Ryan Zimmerman put the Nationals on top for good. Bryce Harper and Ryan Zimmerman have been the faces of the Nationals franchise both past, and present. Zimmerman was the first draft pick ever made by the Nationals. The 2005 first rounder has been dubbed “Mr. National” and has always been a crown jewel of Washington. Then Bryce Harper comes along and the whole team busts wide open. To have two incredibly talented ballplayers on the same team is something that only happens once in a franchise. 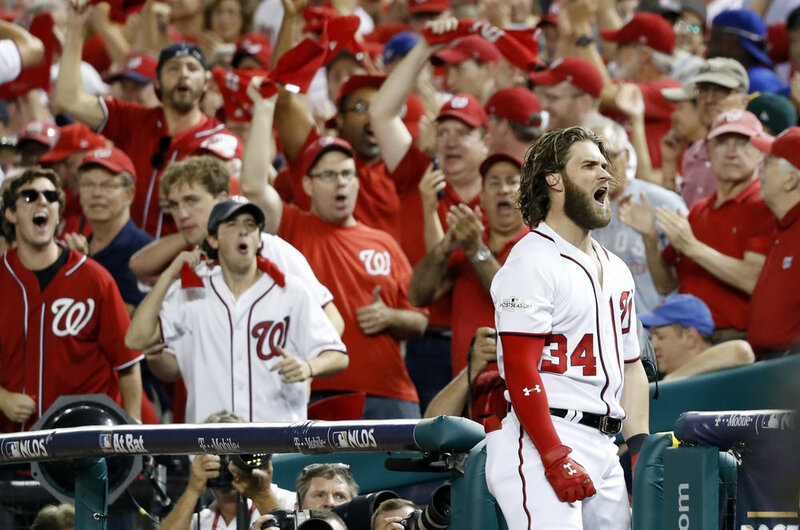 However, in Game 3, they provided a spark that propelled the Nats to a 1-1 tie going to Chicago. 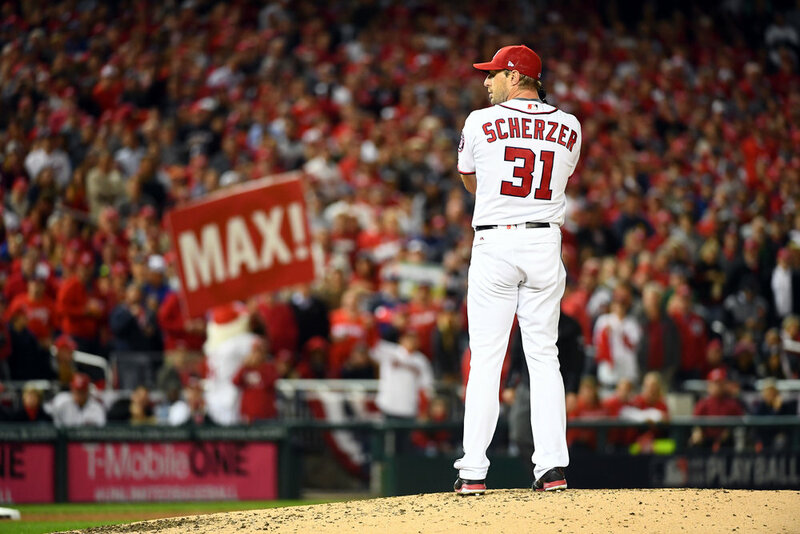 Mad Max Scherzer took the mound in Game 3, a move that could have ended in disaster. Pitching injured this early in the postseason very rarely works out in the long term. 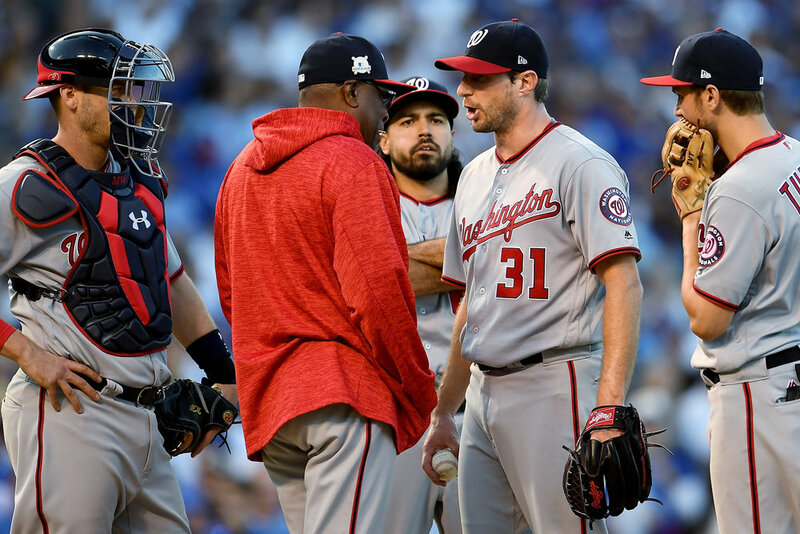 The idea of not having Max Scherzer for the rest of the postseason didn’t make Dusty Baker blink and gave him the ball in game 3. There’s something interesting about Wrigley Field in the postseason. Things either go your way in the best of ways, or they blow up in your face. Kyle Hendricks was lights out in 2016, but we saw Kershaw falter. We saw the Mets starters lock down a sweep of the Cubbies in 2015. Wrigley is a cruel mistress unless she’s on your side. She was definitely on Scherzer side as he pitched 6.1 innings of 7 strikeouts, No-Hit baseball. I Don’t think Dusty Baker’s decision to pull Scherzer after his no-hit bid was gone and the Nationals were clinging to a one-run lead, was a bad one. Not in the slightest, but once again, he doesn’t have any idea about how to play a game two or three steps ahead. The Nationals are up by 1 and with Kyle Schwarber coming up to the plate, followed by Jason Heyward and Addison Russell. 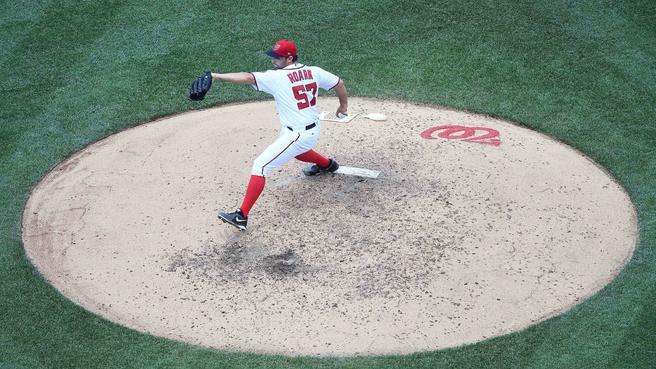 Mad Max is at 98 pitches, and the Nationals bullpen has been nothing by a black hole for wins. Call me crazy, but I stay with Scherzer. Instead, Almora pinch hits for Schwarber and drives in Zobrist. Game Tied. The Nationals fell to the Cubs 2-1. The Bullpen once again fails their starters. 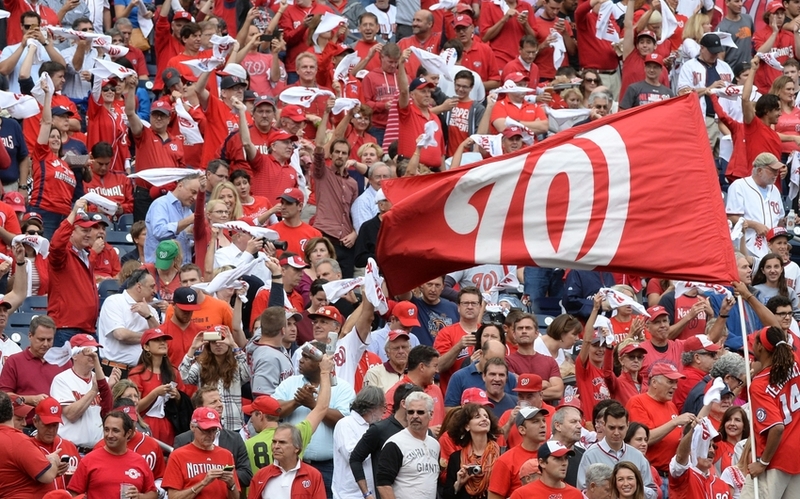 Now the Nationals find themselves in a situation they know all too well: Facing Elimination. So who is to blame for this decline in offense? The answer might surprise you! First off, on a general scale, the Nationals are not hitting whatsoever. The only two players hitting over .200 are Michael A. Taylor and Ryan Zimmerman, both sitting at .250. Everyone else has been non-existent. In fact, the Nationals have recorded 11 hits in the first 3 games, which evens out to just over 3 hits a game. That’s not going to do the trick, not against the Cubs. 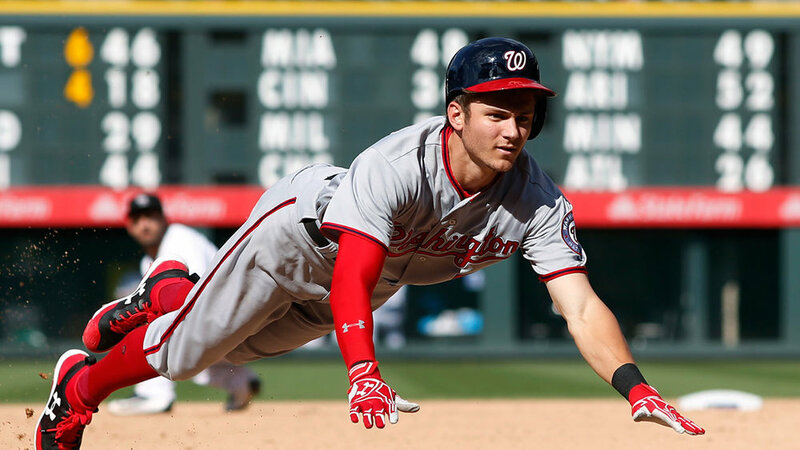 Trea Turner is a star player who has been the most dormant these past two games. Keeping runners off the basepaths is a way for the Cubs starters to keep the tempo and the momentum of the game in their hands. Imagine a world where Bryce Harper isn’t the only thing you have to worry about. That’s the game the Nationals have been playing all year, and they’ve been unable to get anything going offensively from the top down. Can you sit Trea Turner? No, but you better hope he turns it around. That’s a weapon that’s just sitting there, growing cold. Daniel Murphy’s postseason looks nothing like his other trips into October. Murph put up an insane .438 average in last years tilt with the Dodgers but has severed up a fat nothing this series, posting a .091. Daniel Murphy’s 2015 postseason looms large over his head, but much like his 2015 World Series, he’s grown cold. Where’s the threat on this offense? Tell me. Where? So now the onus is on Tanner Roark to keep the Nationals in Game 4, while the rest of us cross our fingers hoping the offense pulls their heads out of the sand. What I don’t like about Tanner Roark starting Game 4 is the fact that Tanner Roark is starting Game 4. In all seriousness, this is an awful move. Whether or not Strasburg or Gonzalez comes out of the bullpen is beside the point, the fact of the matter is that the Nationals season is resting squarely on the shoulders of Tanner Roark. That’s a problem. Roark has never pitched more than 4.2 innings in a playoff game, and this game would mark his second career postseason start. Speaking of career numbers, Cubs hitters are batting .277 against the Nationals pitcher, who boasts a 4.06 ERA against the reigning World Champs. Do you feel good about those numbers? I don’t. This game is going to make or break the Nationals. If they can pull out a win against Jake Arrieta and Roark holds his own without vomiting all over himself, the Nats could take this series. I’m serious. If you’re Chicago, do you want to face the Nationals at home with their backs against the wall for the fourth time? Fool me once, shame on you. Fool me three times and try to make it four? Maybe get pucnhed in the mouth. UPDATE: It has not come out, albeit unconfirmed by the club, that Stephen Strasburg will pitch Game 4 today. If this is true, it’s MASSIVE for the Nationals. Strasburg was insane in Game 1 and this tells us that Dusty Baker isn’t messing around anymore. The Nats are now 100% back in this series if Strasburg pitches. LETS. GO. Looking for tickets to the game? Check out the last minute deals on SeatGeek! Click here to see what’s available!